In many industrial processes, temperatures must be controlled exactly to ensure the required quality levels. Various thermal transfer media are used to cool and heat, including air, water, oil or mixtures of these substances. 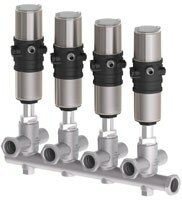 Process temperatures can be regulated reliably on the basis of the flow values and with the aid of an intelligent solution. To help you keep a cool head, we provide a simple and flexible solution for your industrial applications - The Modular Process Control Platform for Heating and Cooling. 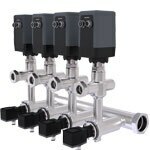 All sensor variants deliver reliable measurement values and can easily be integrated into your system, irrespective of the application. The compact design and close-to-tool placement minimize the dead volume. To that, the energy efficiency can be increased through the reduction of heat dissipating surfaces. Due to orbital welding seams and high-temperature graphite seals there won’t be any leakages even with extreme temperature fluctuations. 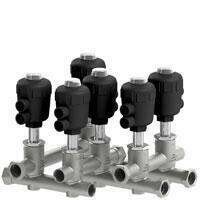 Furthermore there is no installation work needed for piping between the valves. 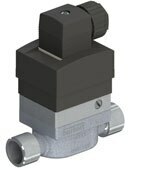 Choose between different actuator, system and sensor variants and a suitable communication interface specifically for your application. Just feel free to contact us with your individual needs. Whether during aluminium die-casting, foodstuffs extrusion, injection moulding or extrusion & calibration – the Modular Process Control Platform cuts quite a dash.